with RENEW's Tyler Huebner in the background. Yesterday, RENEW Wisconsin was in the audience as Governor Scott Walker announced the State of Wisconsin’s intention to invest in biodigesters that will turn dairy manure into renewable energy while assisting with improvements in water quality. Governor Walker announced that the Public Service Commission, Department of Natural Resources, and Department of Agriculture, Trade, and Consumer Protection are working together to deliver a Request for Proposals in January 2017. The request for proposals will allow private firms to submit bids to meet the goals and specifications set out by the agencies. A major goal of the initiative is to aid with water quality problems in environmentally sensitive areas of the state, and the announcement was made in Kewaunee, one of those regions. 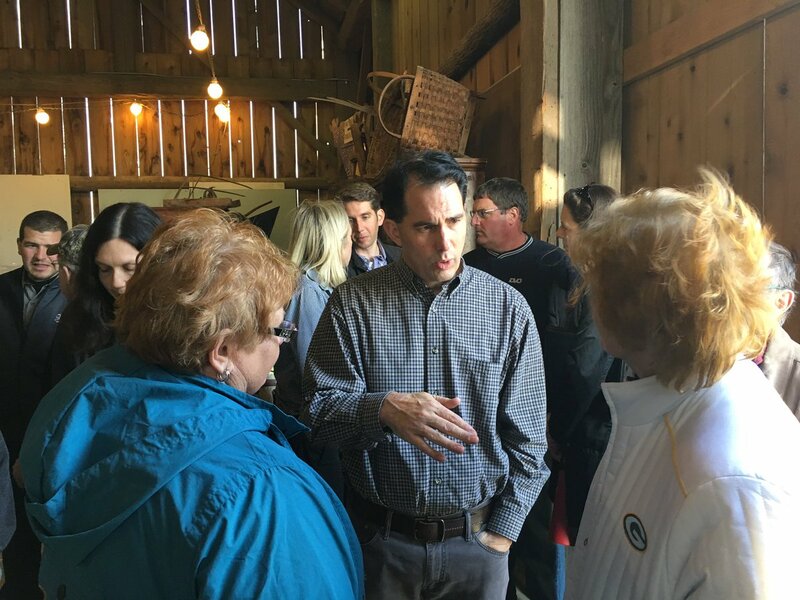 Governor Walker indicated that this initiative is one of a series of steps, and not in and of itself the only solution, needed to aid water quality in Kewaunee County. In many of the digesters on farms in Wisconsin today, the methane is cleaned and passed through a generator to create electricity, which is sold to the local power company. Most of these digesters are located right on the premises of the dairy farms. The system envisioned by the Governor’s announcement, according to a recent interim order from the Public Service Commission, might collect manure from farms of all sizes, and process it in a centralized biodigester. Instead of using the methane to create electricity, it could be further cleaned and then injected into the natural gas delivery system. Natural gas is used to heat homes and businesses as well as power industrial processes. (The PSC’s interim order can be found here, see pages 9 thru 11). Digesters process manure in a way that can enable water quality improvement technologies to be added onto the system. Dane County has been investing in these systems over the past half-decade to accomplish similar water quality improvement goals, and their recently passed County Budget includes $18 million to inject methane collected at the landfill into the natural gas pipeline system, similar to what the state may be envisioning. “Digesters can provide a lot of benefits when they are designed, engineered, and operated with proven technologies and by companies that have delivered solutions that work. Leadership, collaboration, and transparency will be needed throughout the process to ensure the project’s success. The State’s leadership and funding commitment is a solid next step to bringing more digesters online in Wisconsin,” concluded Huebner.